Broadway star Ethel Merman's voice was a mesmerizing force and her vitality was legendary, yet the popular perception of La Merm as the irrepressible wonder falls far short of all that she was and all that she meant to Americans over so many decades. This marvelously detailed biography is the first to tell the full story of how the stenographer from Queens, New York, became the queen of the Broadway musical in its golden age. Mining official and unofficial sources, including interviews with Merman's family and her personal scrapbooks, Caryl Flinn unearths new details of Merman's life and finds that behind the high-octane personality was a remarkably pragmatic woman who never lost sight of her roots. Brass Diva takes us from Merman's working-class beginnings through the extraordinary career that was launched in 1930 when, playing a secondary role in a Gershwin Brothers' show, she became an overnight sensation singing "I Got Rhythm." From there, we follow Merman's hits on Broadway, her uneven successes in Hollywood, and her afterlife as a beloved camp icon. 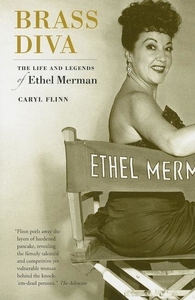 This definitive work on the phenomenon that was Ethel Merman is also the first to thoroughly explore her robust influence on American popular culture.